We are amongst the renowned manufacturer, supplier and service provider of excellent range of Non Woven Bags which include our Non Woven Fabric Bags, Non Woven Shoe Bags, Non Woven Carry Bags, Non Woven T-shirt Bags, Printed Non Woven Bags, Non Woven Grocery Bags, Non Woven Shopping Bags and Wine Non Woven Bag. We hold expertise in manufacturing, supplying and providing service for top quality array of Wine Non Woven Bag. These wine non woven bags are highly demanded as durable and very elegant wine bags that are able to handle varying number of wine bottles. Our wine non woven bags are customized to fit various types of wine bottles and with adorable prints and colours that are carefully designed. These wine non woven bags are easy to use available to our esteemed clients at very reasonable range of prices. We hold proficiency in manufacturing, supplying and providing service excellent array of Non Woven Carry Bags. These non woven carry bags are ideal bags for bringing in the market and shopping centers as durable and lightweight bags. Our non woven carry bags are very spacious, sturdy and provide excellent support to the weight of the items. These non woven carry bags are very efficient to use with flawless stitching that are quality checked and inspected before dispatching to our clients. We are offering these non woven carry bags at market leading range of prices. Serving our clients in the past long years, we are able to manufacture, supply and provide service for best quality array of Non Woven Packaging Bags. These non woven t-shirt bags are very eye pleasing with customized labels and designs depending on specifications. Our non woven t-shirt bags are perfect for packing cloths and garments in different commercial shops. We offer high strength and high quality non woven t-shirt bags in various sizes and designs at very economical range of prices delivered on timely manner. We brought forth our range of Non Woven Grocery Bags which we manufacture, supply and provide service in wide range. Our non woven grocery bags are best for carrying grocery products and items with its supreme strength and durability. These non woven grocery bags are customized with different compartment and sizes to effectively hold different items such as bottles, canned goods and many others. 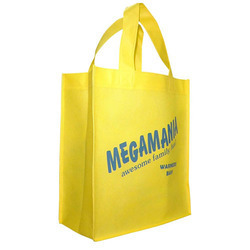 Clients can avail from us our range of non woven grocery bags at very reasonable range of prices.